As a best practice, a DBA would always like to have the DB data files to be placed on a separate drive/volume. To change the folder location, you need to modify it in “MySQL Workbench” > Under Instance, Options File > General Tab > Directories > datadir and set the path to the folder on a another drive/volume (as shown below). Then click Apply. Then copy over the Data Files from initial location to the new location. That is from “C:/ProgramData/MySQL/MySQL Server 5.1/Data/” to “D:/myDB” in above example. p>Now Re-launch the “MySQL Workbench” then goto Under Instance, Startup / Shutdown MySQL Server” > click “Start Server”. Provide the password for the two prompts you receive. 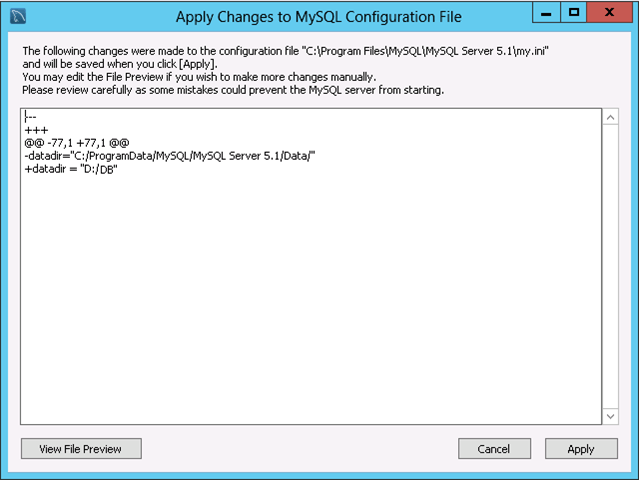 Then now your MySQL should be running fine with Data Files being relocated or moved from it’s default “C:/ProgramData/MySQL/MySQL Server 5.1/Data/” to “D:/myDB”.